Yorgos Lanthimos's eagerly anticipated follow-up to the Oscar nominated, cult smash Dogtooth is another weird and wonderful exploration of human psychology. Revolving around a group calling themselves the Alps – a service providing stand-ins in for the recently deceased, hired by relatives, friends or colleagues to aid the grieving process – the film bounds from one bizarre set-piece to the next in a dazzling mix of black humour, unsettling drama and delicious ambiguity. Both a companion piece to and in many ways a reversal of Dogtooth, Alps finds Lanthimos building on that film's surreally terse style and notions of communication and identity without diluting its singularity or concentration. Working with cinematographer Christos Voudouris, he composes his images (with characters frequently decapitated by off-center framing or liquefied into out-of-focus background forms) to conjure up an atmosphere of dread that hangs over even the most deceptively tranquil scenes. By swathing every relationship in layers of hierarchical pretense and distortion, Lanthimos envisions social order itself as a continuous performance, an existential variation of Shakespeare's dictum about the human race as players on the world's stage. Given our love of Dogtooth, it's actually odd we haven't managed a review of this one yet. 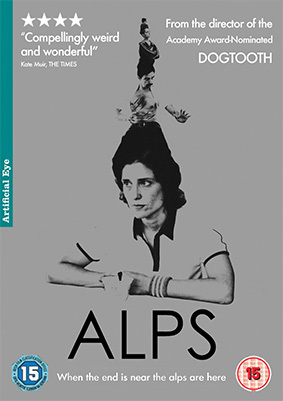 Alps will be released on UK DVD on 11th March 2013 by Artificial Eye at the RRP of £15.99.